I was just discussing Oscar Pistorius with a colleague yesterday after we saw him on the TV in the gym. At the time we didn't know what the story was about, but we discussed his attempts at being able to run against able bodied athletes. The last we'd both heard, the IAAF banned him. Well, I most definitely missed something: the Court of Arbitration for Sport actually overturned this ban way back in 2008 and Oscar has been allowed to compete against able bodied athletes ever since. 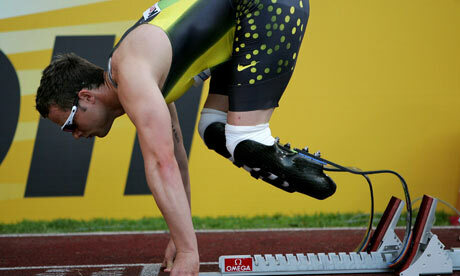 In fact he just missed out on qualifying for the 2008 Beijing Olympics. Well, he's now one step closer to his dream of taking on the world's finest at the biggest athletics meet in the world, the Olympic games. On Tuesday evening, Oscar smashed his previous personal best by winning the 400m in Lignano, Italy in a time 45.07, 0.18 seconds INSIDE the South African "A" qualifying time. This time means he can compete in this year's World Champs in Daegu, South Korea and is eligible for the South African selectors to name him on their list of athletes heading for London next year. The next step in Oscar's dream is firmly in the hands of the SA selectors. I really hope they do the right thing and select him.